Last week, Philippine defense officials offered a few additional specifics of where the Southeast Asian was with respect to the acquisition of a submarine capability. While much of this was with respect to activity already ongoing, the comments nonetheless shed some light on how Manila is currently proceeding and how things might shape up in the coming months. As I have noted before in these pages, the idea of the Philippines developing a submarine capability is not a new one and dates back to at least the 1990s. The Philippine government has not only studied the issue but has also already taken some initial steps towards that long-term goal, including setting up a submarine office in 2013 and including it as a potential line item in its longer-term military modernization plans. But the Philippine pursuit of a submarine capability continues to make the occasional headlines under Duterte, especially as the country thinks about it future military modernization. The last round of headlines came around June, when Defense Secretary Delfin Lorenzana said the Philippines was currently looking for potential suppliers for its submarine pursuit (See: “Is the Philippines Moving Closer to Submarines Under Duterte?”). Since then, there have been some focus on where exactly the Philippines is in its pursuit of a submarine capability under Duterte. One aspect of this is how exactly the submarine capability will fit into Philippine military modernization plans. 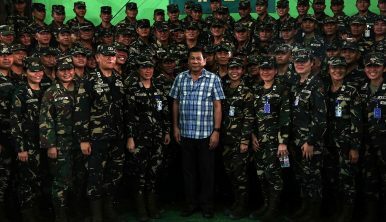 Though earlier indications were that it would be part of the Third Horizon of military modernization from 2023 to 2027, Philippine officials had indicated that it could be fast-tracked such that inroads are made before the expiry of Duterte’s single six-year term in 2022. Another aspect of that has been the range of suppliers that could be considered. Though there has been no official shortlist announced, references to submarines have been making their way into media accounts related to wider defense engagements the Philippines on countries ranging from South Korea to Russia. Yet few details have been offered as to what the exact timeline may look like and additional specifics on the status of the acquisition itself. Philippine officials have continued to reference the fact that there have already been ongoing steps that continue, including studying and training with respect to submarine operations in preparation for the acquisition. Philippine Navy spokesperson Jonathan Zata reiterated this again last week when he said that the initial steps had already been taken in terms of acquiring skills and examining aspects of Philippine defense capability such as doctrine, organization, training to factor in a submarine capability. Also last week, Philippine defense spokesperson Arsenio Andolong also added some additional specificity when he said that the PN was in the process of conducting market research and doctrine studies on how the country would cost its submarine purchase as well as fit in into its range of defense capabilities in terms of usage and deployment. Andolong also indicated that such steps were significant because they had not been taken before and constituted the increased seriousness Manila is displaying in its pursuit of the capability. Significant as though such steps might be, it is still early days with respect to the Philippines’ acquisition of submarines. The Duterte administration continues to examine its options in this regard while also reemphasizing the importance of acquiring an expensive capability to the wider public. Irrespective of how it proceeds, this line item in Manila’s military modernization will continue to be an important space to observe.